07/01/2013: New Year, New Office? With the start of a new year, a new raft of business opportunities and a sense of rebirth appear. If you are starting a new venture or possibly spending more time working from home in 2013, it may be easier if you start off by not spending more than you have to in order to set up and equip your new office. With W&N Solutions Ltd., you really can have the best of both worlds. Because we recycle office furniture, you can start of with the best quality furniture; comfortable chairs, strong desks and secure, stable filing, but pay no more, or even less, than you would find yourself paying for budget items that wouldn't necessarily stand the test of time. 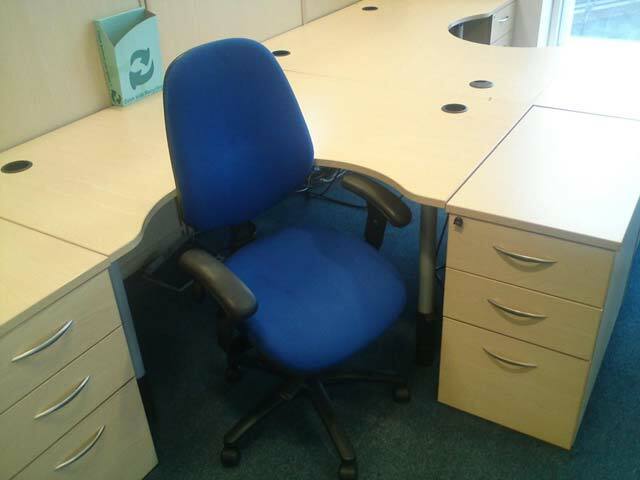 Whether you need a single chair, or you are equipping an office for a hundred, you will find the same level of quality, service and fair pricing that has earned us an enviable reputation in the recycled office furniture business throughout Essex and London. Give us a call today, or click in the header of any page to email us your requirements. Are you sitting comfortably? No? Then how about one of our exclusive Girzberger operator's chairs. We have a quantity of these in excellent condition and they are selling for a fraction of their original cost. Just ?50 + VAT each in fact. The chairs are hard-wearing and beautifully made to last with adjustable arms, seat height, back and tilt. Call us now on 0844 770 1021 or click in the header of any page to email us while we still have some of these great chairs in stock.